Product #1484 | SKU VHUBUV/72CH | 0.0 (no ratings yet) Thanks for your rating! The Blackmagic Design Universal Videohub 72 is a customisable rack frame that lets you build your own 72 x 72 SDI size router. 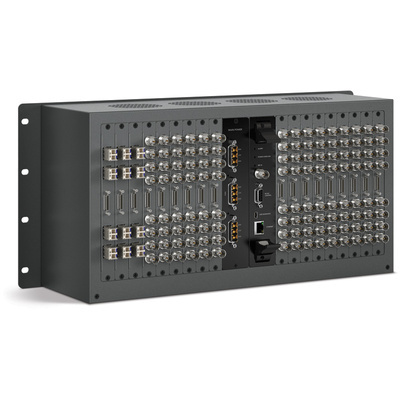 Only 5RU high and 6" deep, the Videohub 72 is designed to accept a mix of SDI interface, crosspoint, and power supply cards, as your application sees fit. Add up to 18 BNC SDI or optical fibre SDI interfaces along with a single 72 x 72 crosspoint and power card. Other features include a removable fan tray, full auto standard detection, re-clocking, 3Gb/s SDI support, 72 x 72 deck control, and ethernet/serial control. When you're ready to upgrade, all SDI interface cards, crosspoint and power supply cards can be installed into the larger Universal Videohub 288 chassis. Connections SDI Video Input: Up to 72 x SDI/HD-SDI, 3Gb/s SDI and ASI. Can be BNC SDI or optical fibre SDI. SDI Video Output: Up to 72 x SDI/HD-SDI, 3Gb/s SDI and ASI with SDI re-clocking. Can be BNC SDI or optical fibre SDI. SDI Colour Precision: 4:2:2 and 4:4:4 10 bit. SDI Colour Space: YUV, or RGB.